I’ve considered lots of different dimensions of inequality on this blog, including the fact that inequality kills. 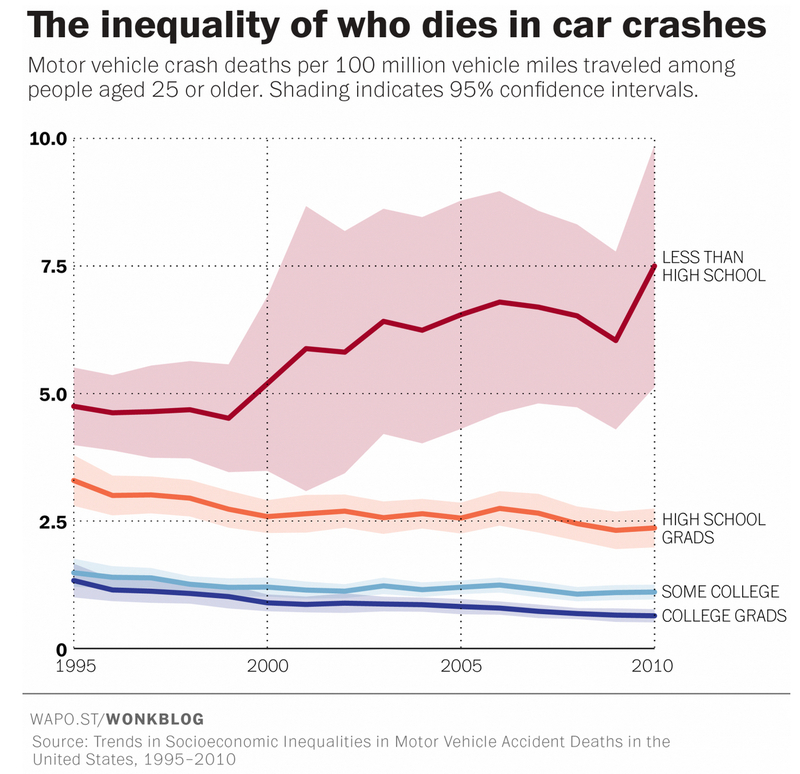 But, I’ll admit, I have never considered the unequal impact of car crashes on the nation’s roads. Traffic fatalities in the United States have been plummeting for years, a major victory for regulation (strict drunken driving laws have helped) and auto innovation (we have safer cars). But that progress obscures a surprising type of inequality: The most disadvantaged are more likely — and have grown even more likely over time — to die in car crashes than people who are well-off. The underlying issue here is not that a college degree makes you a better driver. Rather, the least-educated tend to live with a lot of other conditions that can make getting around more dangerous. They own cars that are older and have lower crash-test ratings. Those with less education are also likely to earn less and to have the money for fancy safety features such as side airbags, automatic warnings and rear cameras. The number of trauma centers. . .has also declined in poor and rural communities, which could affect the health care people have access to after a collision. And poor places suffer from other conditions that can make the roads themselves less safe. In many cities, poor communities lack crosswalks over major roads. The residents who live there may have less political power to fight for design improvements like stop signs, sidewalks and speed bumps. As a result, pedestrian fatalities in particular are higher in poor communities. Yep. Capitalist inequality kills in more ways than even I had been able to imagine.